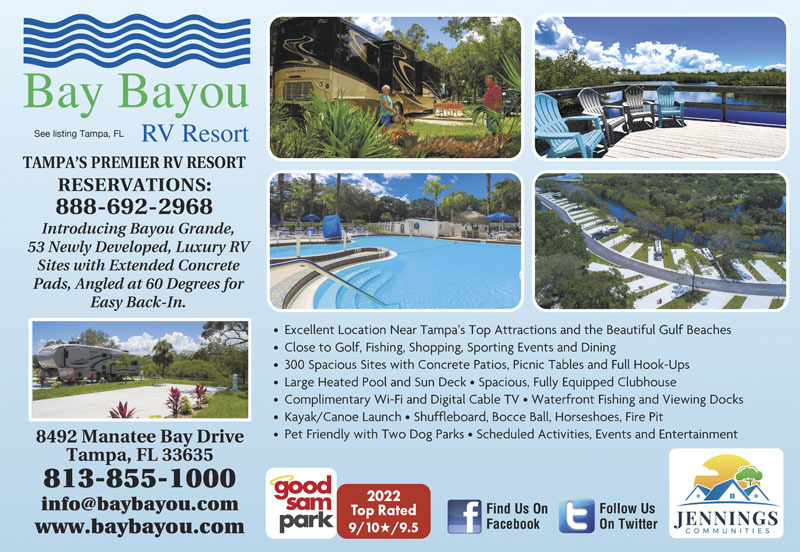 Natural surroundings on Double Branch Creek just minutes from Tampa and Clearwater's top attractions and Gulf beaches. 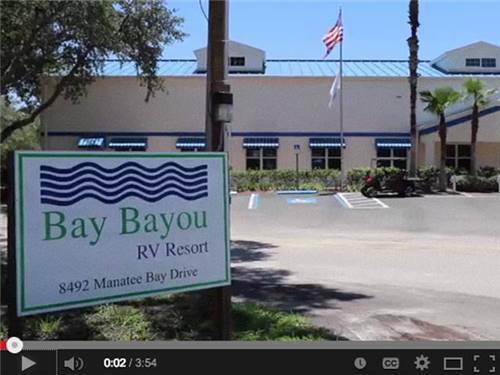 Bay Bayou offers deluxe facilities and amenities with a friendly staff to assist you. The Park is beautiful, the employees are very friendly and helpful. We are very close to many activities, restaurants and grocery stores. 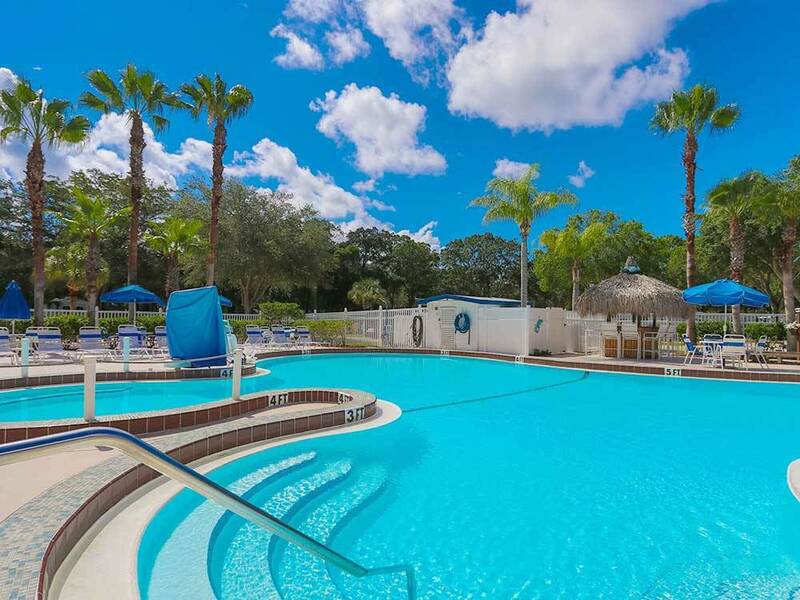 The park have a gorgeous pool, fishing deck and kayak launching areas... We would highly recommend. Our only complaint is about an RV cleaning company that works this park....we thought we did our due diligence, but found the owner of the business implies he will do the work, explaining his experience....then sends someone who doesn't even know what we discussed...nor has the experience or expertise we needed....Detail Daddy of Tampa would receive 0 stars from us....as we will need a proper job again, soon. Live and Learn, we should have cancelled when the wrong person showed up, but we texted the owner who said he would be joining the other person, NOT. This is a very nice park located just minutes away from the Tampa urban sprawl. Fairly quiet despite the close proximity to a major highway. We were fortunate not to have a site close to that highway but were approximately 200 yards away. Cannot comment on those sites closest. Most campers were in 5th Wheels, no big deal. The sites are fairly compact but if you neighbors are thoughtful there is no reason why a big rig couldn't fit (our is 36 ft class A). The park was proactive and made the site marker posts removable so that there was extra room to back and get situation. The ladies in the front office were exceptionally nice; ice and other items were very reasonably priced. Free cable and wifi! The pool looked to be clean and inviting. Sadly, no military discount for retirees, just active duty. I guess 28 years of service doesn't count because I am now an old duffer:-) They offer a FL resident discount which is better than the Good Sam Club discount. We will definitely stay again!